Looking for a great romantic suspense read? 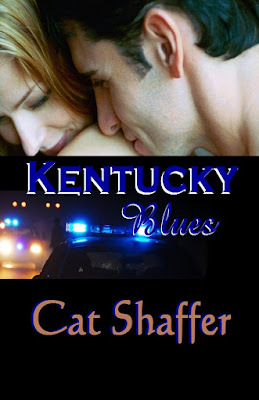 Cat Shaffer's recently released Kentucky Blues is awesome! It is chock full of small town characters, sizzling sexual tension, all woven with a thread of suspense that keeps you guessing until the end. Will Elise survive the scheme to rescue her old boyfriend, Sam McCade',s mother from a mad man? Is Elise's mother really sleeping with Elise's old boyfriend. And...will Sam and Elise ever admit that they are really and truly still in love with each other? Elise Drummond has never forgotten her first love – and never expected to learn via the grapevine that he was back in Brookville and living with her mother. Sam McCade had broken her heart, and she wasn’t about to let him destroy her mother’s as well. A quick trip back to Kentucky to lay down the law and she could back to the safe life she’d built for herself in Kansas City. When Sam McCade went on the run in the middle of the night to save his sister from her abusive husband, there was only one person he could trust to help them, Hannah Drummond. He expected the local gossips to have a field day with his return to Brookville, but he never dreamed Elise would roll into town to check out the situation for herself. And he certainly never imagined that in order to save his sister, Elise would be willing to sacrifice herself as the pawn in a dangerous game of catch the monster when his brother-in-law decides to take back what he wants – no matter who stands in his way. Kentucky Blues is available in print and eBook formats at Turquoise Morning Press and wherever books are sold.